Delta Force Paintball Maidenhead Features State-of-the-art Technology! Delta Force Paintball Maidenhead features the latest in paintballing technology, having recently been renovated to the sum of £150,000! And as the newest additions to the Delta Force family, our Maidenhead Paintball Centre provides customers with top-of-the-range game zones and Hollywood-type scenarios to act out with your friends! It’s the ultimate paintball experience! The Maidenhead venue sits in a gorgeous rural area of Berkshire on a hug 100 acre plot. It’s the perfect setting for any paintball enthusiast looking for a stunning backdrop while they play. 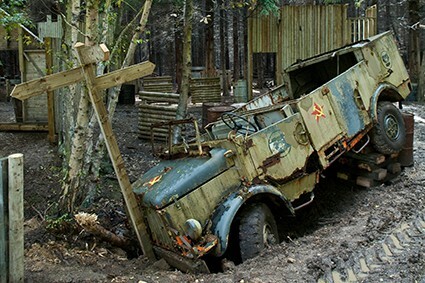 The impressive game zones at Delta Force Paintball Maidenhead include ‘Siege of Stalingrad’ which features a huge Soviet-era military truck, straight from the 007 Bond film ‘Tomorrow Never Dies’; ‘The Black Pearl’ which has a huge 50ft long Galleon for players to use and ‘The Zombies’ Crypt’ featuring lots of life-size coffins and tombstones! Spooky! Having already been recognised as one of the leading UK paintball centres, customers from as far as Nottingham have been to our Maidenhead paintball Centre to witnessthe ultimate paintball experience using state-of-the-art technology. 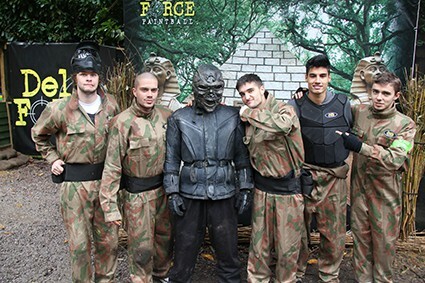 Even celebrities such as The Wanted have been to our Maidenhead Centre to play paintball! Singers Siva, Jay, Tom, Nathan and Max all spent the day at Delta Force Paintball Maidenhead, darting about in the woods and shooting paintballs at one another. They were also joined by a group of lucky fans who won a competition to play paintball alongside them! Lucky beggars! Basecamp at Delta Force Paintball Maidenhead is also of the highest quality, including proper flushing toilets on mains water and open and covered picnic areas with plenty of seating for customers to relax in comfort. We also supply secure lockers for guests to store their valuables (for a small charge). At lunchtime we can provide customers with hot pizza lunches, provided by a local, offsite catering company. And if it’s a special occasion (like your birthday!) we can arrange for cake (BYO) to be served too! For further information on Delta Force Paintball Maidenhead or to arrange your paintballing activity with us, call the booking line on 0203 869 9301 today!